As noted elsewhere (see portal on Underground Naples), Naples is honeycombed with hundreds of manmade tunnels and caves. There are also a lot of simple unplanned holes in the ground in the form of cave-ins and sink-holes. These often occur beneath the streets and buildings at higher elevations. The city is largely built on a hill, and you can only dig and put up so many new buildings and lay down so many new miles of track for subway lines before the hill starts to sag and crumble in protest. Four such holes opened last week along the street called Vico San Carlo alle Mortelle just below the major road of Corso Vittorio Emanuele II in the Chiaia section of Naples. Five buildings were evacuated, causing the displacement of 297 persons. 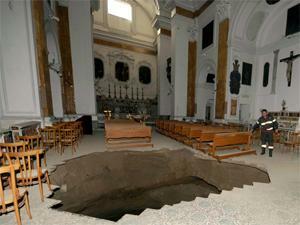 One of the sink-holes opened within the church of San Carlo alle Mortelle (photo, right). There were no injuries, perhaps due to the fact that the cave-ins happened in the middle of the night when people were inside and asleep. The road, itself, bears heavy traffic in the morning and afternoon rush hours. Well, bore traffic; the street has been closed. It's one thing on the streets, but a number of Neapolitan hospitals (!) report the presence of itinerant vendors wandering the corridors and peddling everything from sandwiches to coffee to newspapers and--particularly egregious--cigarettes to patients in the ward for respiratory ailments! That case came to light yesterday when the private rent-a-cops that guard these institutions busted a kindly 64-year-old gentleman and found hundreds of packs of black-market (no tax stamps) lung-busters in his 24-hour bag. In a city already awash with ongoing major construction of underground train tracks and surface stations to go with them, someone at city hall has seriously proposed the construction of a suspension cable lift (as in chairs or cabins that you ride up to the tops of mountains!) that would connect the National Archaeological Museum at the bottom with the museum at Capodimonte at the top. That ride would climb about a mile and be suspended along the way by a series of massive pillars built in the Sanità section of the city. Residents along the proposed route are against the idea, and skeptics at city hall recall a similar experience many years ago: When the Mostra d'Oltremare (Overseas Fair Grounds) opened in the 1930s, it was at one end of a spectacular suspension lift that ran above Fuorigrotta and to a station high up on the scenic Posillipo ridge. It was a great ride, but fell victim to urbanization. The lift was closed in 1961 to permit buildings to go up around the suspension pillars, themselves The buildings went up very fast, well before anyone could figure out what to do with the pillars. The pillars are still there! Some windows in the upper floors of nearby buildings open directly onto these concrete mastodons. The pillars cannot be removed without the use of explosives, so it's safer (and uglier) to leave them in place. The same thing would surely happen with this new one to Capodimonte, say critics. CRESME stands for Centro ricerche economiche sociali di mercato per l'edilizia e il territorio [Center for social and economic research on construction and real estate]. It has just released an eye-opening report (for those whose eyes were for some reason still closed to these problems): the province of Naples (of which the city of Naples is the capital), one of the five provinces in the Campania region of Italy, is at great risk in case of of earthquake or flood. In case of earthquake, 1,651 school buildings and 33 hospitals in the province are at significant risk. In case of flood, 354 schools and 4 hospitals are at risk. The report comes on the heels of the recent flood disaster in Messina at the beginning of October and is not that far removed in time (1998) from the Sarno floods in the province of Naples that killed 137 persons. Word comes that Naples will host the 63rd International Astronautical Congress in 2012. (Indeed, people have been thinking about space travel for quite a while; the first congress was in Paris in 1950. That single-stage rocket ship in the logo on the right looks suspiciously like a V-2!) That might help to make up for the loss to Barcelona in the bid for the 2007 America's Cup regatta. It has even encouraged the Naples City Parenting Persons to reach for the stars in another way: they have announced a plan to be one of the Italian cities that will bid for the 2020 summer Olympic Games. Stay tuned. An infamous scene from Francesco Rosi's 1963 film Le mani sulla città [Hands on the City] shows a bunch of corrupt politicians and land speculators feasting on a cake model of the Bay of Naples, devouring everything in sight. It happens in real life, too! In Giugliano, near Naples, 38 people are under investigation --judges, contractors and possibly some real bona fide criminals-- for having thrown up 98 housing units and a hotel along an historic section of the famed Appian Way. It was all to be part of Parco l'Obelisco, a planned tourist village. Investigation continues, bank accounts have been seized and all of the housing has been sequestered. Round up the usual suspects. Via San Gregorio Armeno. That was quick. The city hall has caved in (not literally, although that, too, is devoutly to be wished). In the dispute over the presence of outdoor stalls and stands to display Christmas wares (above) the shop owners have won. Heavy traffic on the Rome-Naples autostrada the other night caused film star Sophia Loren to miss her son Carlo Ponti's debut as conductor of the San Carlo orchestra, in concert at the RAI auditorium in Fuori Grotta near Naples. The show must go on and it did: a little-known work by the young Puccini,Capriccio sinfonico; Brahms' Symphony #2; and the Schumann A minor cello concerto, featuring American cellist, Alisa Weilerstein. Yesterday, Sunday, November 1, was All-Saints Day. People generally go to the various cemeteries in town to visit their dearly departed. You drive there and try to find a place to park and try to find some flowers along the way. The throng is incredible. It got so bad yesterday that the police had to step in. They ticketed 79 illegal car park attendants and actually arrested one of them who was charging people five euros to "watch their car." The cops also confiscated 3500 bouquets of flowers from itinerant vendors in the area. (This is vaguely related to the general entry on the "flower people" of Naples.) What do the cops do with 3500 bouquets of flowers? Distribute them to churches, according to this morning's paper. You don't need Bernoulli's Principle to know which way the wind is blowin'. Recent letters to the editor in the papers have complained about Capodichino airport and planes landing from the south-west, over the heavily-populated Vomero section of Naples. It's dangerous and it's noisy, they say, and flights come in until one in the morning. True, true and true. They didn't use to do that and the airport authorities don't care about real people, they say. Wrong and wrong. The physics of flight require planes to take off and land into the wind; it increases relative air-speed over the wings, providing more lift, which is just what you want when you are trying to maneuver a giant tin can through the two most dangerous stages of flight--take-offs and landings. The run-way at the Naples airport runs exactly NE to SW. Most of the time, the prevailing wind blows in from the sea--that is, from the SW; thus, planes usually take off into that wind and climb out steep over the city to avoid disturbing the folks below as much as possible. They then land from the NW over the less populated areas of Naples to the north-west of the airport. But recent winds have been from the north and north-west, requiring take-offs in the other direction, which bother no one, but landings in from the sea over the city can indeed be disturbing. The angle of descent on final approach has to be a gentle as possible for the good folks in the cabin; thus, you have flights coming in low over the city. Some day the winds will change and things will be back to normal. The Royal Apartments in the Royal Palace in Naples are always a pleasure to wander through. I was pleased to see some big-time restoration going on: there is a workshop on the history and restoration of tapestry set up. Also, there is somewhat of a permanent workshop on the art restoration and furnishings as part of a degree program for students of Suor Orsola university. I was fortunate to catch a few of them at work. They were in the midst of a one-year hands-on practicum as part of a degree in Conservazione dei beni mobili e artistici. 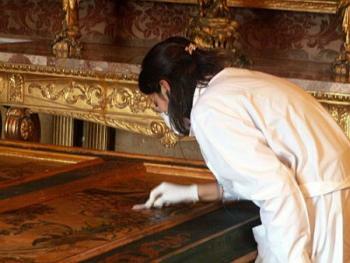 When I was there, they were working on the restoration of a number of large, ornate doors. Most of the students are young women intent on pursuing a career in art restoration.